Maneka Gandhi was recently caught on camera telling a gathering of Muslims in Sultanpur to vote for her or else she may not be inclined to be responsive to their requests. 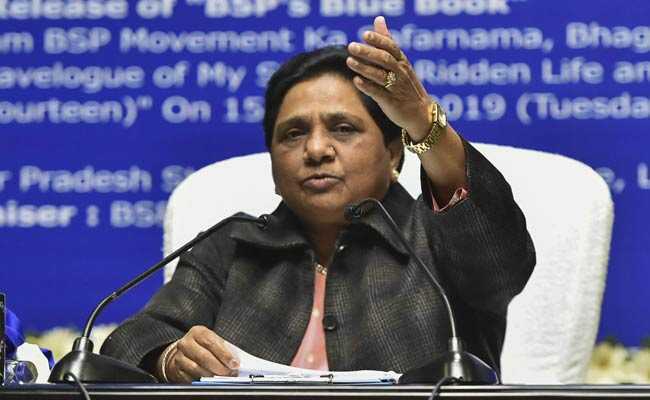 Bahujan Samaj Party chief Mayawati today launched a fresh attack at rival Bharatiya Janata Party and Maneka Gandhi, party lawmaker from Uttar Pradesh's Pilbhit, accusing her of "threatening the voters that their work will not be done". "This is important. I am winning because of the love and support of people. But if my victory is without Muslims, I won't feel that good. Dil khatta ho jayega (Things will become sour). Then when a Muslim comes to me for work, I think let it be, how does it matter. This victory will happen with or without you," she can seen saying in a three-minute clip. After she was served a notice from district magistrate of Sultanpur on Friday over her speech, Ms Gandhi, who is contesting from Sultanpur this time, clarified saying: "I love Muslims and I had myself called a meeting of the BJP's minority cell. I only meant to say that I am winning the elections and their participation would be like 'daal pe chaunka'." BSP supremo Mayawati, who earlier said she won't contest the national elections this time, slammed the ruling party and its lawmaker on Twitter. "BJP leaders forgot issues like black money, corruption, poverty, unemployment, and farmer woes; and started using issues like national security in this election season. But that didn't work out, and now they have started threatening voters that their work will not be done. What Maneka Gandhi has done is condemnable," she wrote in Hindi. In another post, Mayawati said her party was wrongly accused by BJP chief Amit Shah of remembering Dr BR Ambedkar, the social reformer who wrote India's constitution, only in the election season. "The statement by BJP Chief that BSP remembers Baba Sahib Ambedkar only at the time of elections is an untruth. BSP, inspired by Baba Saheb, is a movement that works on the welfare of people every day, every night and on all 365 days. When we have been in power, we have taken some historic decisions in this regard," she wrote, remembering the Dalit icon on his 128th birth anniversary. Mayawati's BSP is fighting national in UP, which sends maximum lawmakers to parliament, in alliance with former chief minister Akhilesh Yadav's Samajwadi Party and the Rashtriya Lok Dal. Eight parliamentary seats in the state voted on April 11 and rest of the constituencies will vote in six phases on April 18, April 28, April 29, May 6, May 12 and May 19.